What would Marcel Duchamp have thought of the age of 3D printing, had he foreseen it? I reckon that the inventor of the "readymade" work of art — i.e., a piece found in the real world and placed into an artistic context, as he famously/infamously did with a urinal for 1917's Fountain — would endorse it as the logical extension of his own creative principles. But man, especially a man like Duchamp, does not live by recontextualized plumbing alone: he also painted, sculpted, and even carved. This last practice resulted, after some time in Buenos Aires the year after Fountain, in his very own one-of-a-kind Art Deco chess set. But now this unique item has turned readymade, so Boingboing reports via Kottke, as "freely downloadable 3D print-files on Thingiverse, where the community is actively remixing them" into versions "like this one, with self-supporting overhangs." Duchamp himself, who appears in the video at the top of the post describing his passion for chess, surely would have enjoyed all this. After his time in Buenos Aires, he moved to Paris, then to America, and, in 1923, back to Paris again, by which time he'd dedicated himself almost fully to the game. 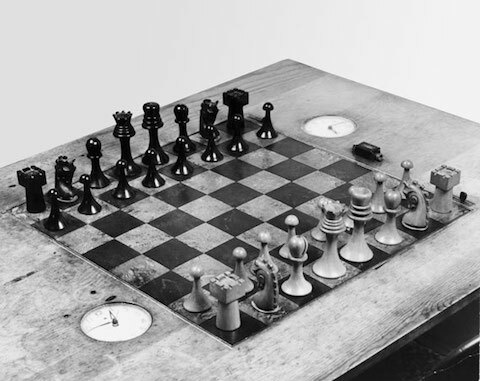 Chess has obsessed many of humanity's finest minds over centuries and centuries, and Duchamp seems to have shown little resistance to its intellectual and aesthetic pull. 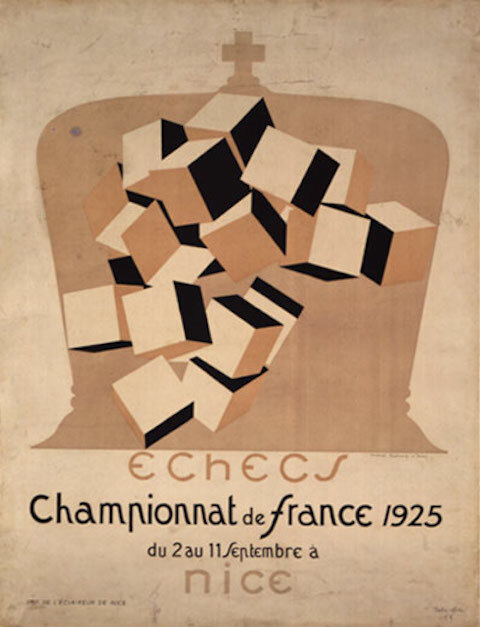 Still, just as he crossed chess and art when he crafted his Art Deco set (pictured above), he did it again in 1925, when he not only competed in the Third French Chess Championship (earning the title of grand master as a result) but also designed its striking poster below. The New York Times' Holland Cotter, reviewing the Francis M. Naumann Fine Arts show "Marcel Duchamp: The Art of Chess," writes that Duchamp ultimately found his two passions not just reconcilable but "complementary, an ideal intersection of brainpower and beauty. Chess was art; art was chess. Everything was about making the right moves."